CSS provided removal oversight and technical assistance to EPA's Superfund Technical Assessment and Response Team (START) during a 4-month removal action at a 15-acre inactive and abandoned Battery Reclamation Inc. (BRI) battery recycling facility in Texas. The purpose of the removal action was to remove and dispose of battery-related wastes and debris at approved disposal facilities. When operattional, BRI generated 35 waste streams, 15 of which are classified as hazardous. 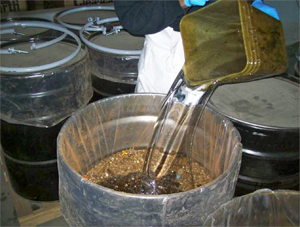 Removal activities consisted of waste characterization; removal of processed battery powders/debris, unprocessed batteries, corrosive liquid, and miscellaneous waste streams; soil excavation; soil confirmation sampling; building demolition and asbestos sampling; and air monitoring. During the removal activities, CSS conducted daily air monitoring for particulates using MIE DataRAMs. CSS staff analyzed supersack and wooden crate samples for total metal/mercury concentrations using Innov-X portable XRF analyzers, sorted them by mercury content into three categories, and tested for Target Analyte List (TAL) metals analysis and TCLP metals analysis for disposal determination. CSS also conducted XRF for characterization of surface soils affected by the supersacks, drums and crates. In total, 9,000 tons of hazardous powders and batteries, 13,000 gallons of corrosive liquids, 3,000 tons of non-hazardous top soil, and 7.5 tons of non-hazardous ballasts and mercury bulbs were removed from the site.